I am a huge lover of wine. A wino perhaps? But in a good way, not the carrying around a bottle in a paper bag kind of way. On it's own, it's a lovely sip. But when paired with food, it's transformed into something even more special. I've always loved red wine and chocolate but for some reason, never really thought about pairing my wine with cupcakes until I met Tammy at Miss WineOH. She was the one to really open up my eyes (and my mouth) to this tasty combo. For obvious reasons, this combo just works. Bite sized cake. Adult grape juice. Yes, please! The seemingly endless cupcake flavor combinations allows you to find the perfect match for your favorite wine. 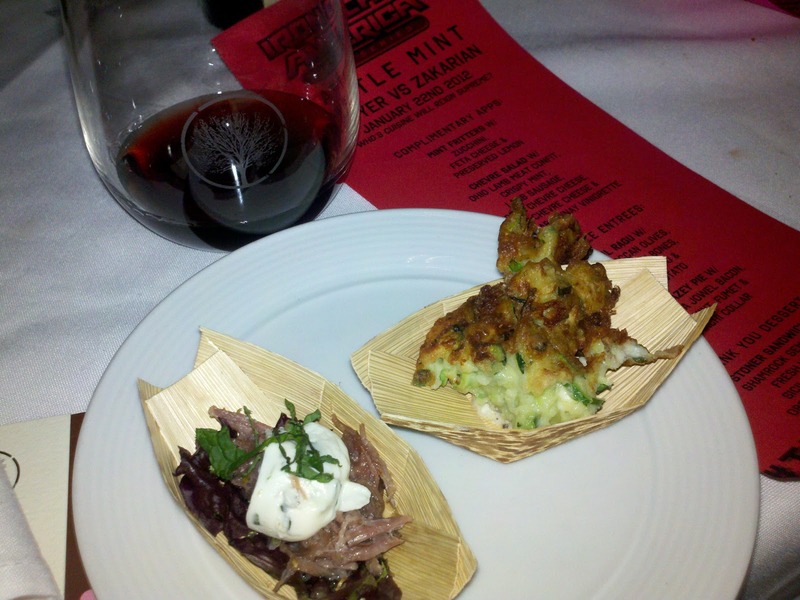 Emerging Chefs is putting their mark on this delicious combo at their upcoming event, Corks & Cupcakes™. 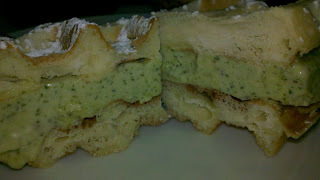 They will be featuring Margaret Mann and Raffaele Scettro of Tuscany Distributors and Lilia Lipps of Indulgence Cakes. There will be an array of Italian wines including white, red and even prosecco being poured with gourmet cupcakes to match. I keep trying to come up with combos in my head - caramel cupcake with prosecco? Would a peanut butter cupcake paired with wine be a like grown up peanut butter and jelly? What combos can you come up with? If this sounds too delicious to pass up, you can get your tickets HERE for $40 each. Ecco per una notte deliziosa! Great Big Home & Garden Expo WINNER! Stefanie's Paganini looks like one not to miss! If you weren't a winner this time, you can still use the discount code EDCLEVELAND and purchase your tickets online for $10 each. Thank you to the Great Big Home & Garden Expo for providing the tickets for my 1st giveaway. And thanks to everyone who participated. Don't forget! Fat Chef premiers TONIGHT at 10pm on the Food Network! This week's episode takes place in New York. Watch pastry chef Michael and soul food chef Melba kick off the new series. Cleveland's own Kimberly McCune Gibson of Hungry Bee Catering and Rocco Whalen of Fahrenheit star in next week's episode Thursday 2/2 at 10pm. You can sign up for a watch party next week at Fahrenheit - click here for details. Cheer on our chefs and see how they transform themselves from the inside out. I've been a homeowner for over 10 years and it always seems like there is something new to do. These things are normally broken down into those you HAVE to do, and those you WANT to do. Obviously, the want-to-do items are the fun, fabulous things you will do some day when all the have-to-do things are done. But that day never seems to come! Every year I get the itch to do something fun without breaking the bank. And the place I always end up is the Home and Garden Expo. The 3rd annual Expo takes place Saturday, Feb. 4 – Sunday, Feb. 12 at the Cleveland IX Center and features more than 650 exhibitors showcasing the best tips and techniques in gardening, home improvement,cooking, and more. The Expo always has lots of inspiration for the home and garden and offers special savings to help make your dreams a reality. Not only does it have hot new products and every kind of home improvement gadget and service, it offers a great escape from the grey Cleveland weather. By February, who isn't fondly remembering their garden, BBQs, flower beds and yes, even mowing the grass. You get to smell actual real FLOWERS and start thinking of spring! And it's not all yard work and chores. They have a bunch of Classic TV show-themed feature gardens that are a Must See for gardeners and couch potatoes alike. You can escape to a faux beach at "Flipper," party at "Cheers" and get your superhero fix at "Batman" and a whole lot more. They also have celebrity guests, demonstrations, two log homes, an eco friendly demo home, and a "Project Runway" Fashion Show. There is really something for everyone! These are sure to be really fun and delicious! There's even an appearance by Rocco Whalen of Fahrenheit, Rocco's Taco's and Fat Chef. He will present “Easy, Elegant and Entertaining Eats” on the Main Stage Feb. 11 at noon and Feb. 12 at 2:00 p.m.
Tickets for the show are normally $14 each but you can save $3 by purchasing them online and another $1 by entering promo code EDCLEVELAND. That's only $10 a ticket! Click HERE to order your tickets. But first, check out this giveaway. I was really excited when the Great Big Home & Garden Expo contacted me because it's my very first blog giveaway and I get to offer you, my super fantastic readers, a chance to win a pair of tickets to the show. 3. Follow @EatDrinkClev and @GreatBigShow on Twitter. 4. Subscribe or add Eat*Drink*Cleveland to your Google reader. 5. Tweet "I want to pimp my pad and THINK SPRING! Enter the @GreatBigShow #giveaway @EatDrinkClev http://j.mp/xBiKwh"
The winner will be selected via Random.org and will be announced here on Saturday at noon. 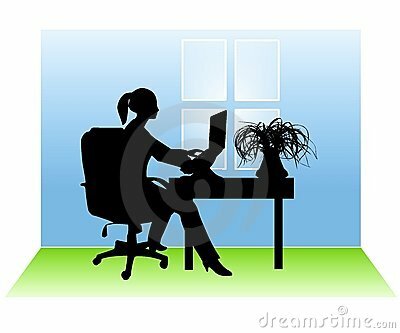 Remember, you must leave a separate comment on this blog for each entry. Disclosure: I was provided two tickets for myself and two to give away to one of my blog readers. As always, my posts and the opinions expressed are 100% my own. Sawyer Puppet in the house! As soon as I heard that our much loved wonder chef Jonathan Sawyer was going to be competing on Iron Chef America, I was giddy! Not only is The Greenhouse Tavern one of my very favorite restaurants in the CLE but the chef is just an all around culinary genius and great guy. I couldn’t wait for him to return to Kitchen Stadium and show the rest of the country his mad kitchen skills. All the fans were in a frenzy leading up to Sunday’s show. The Tweetdom was on overdrive with Tweets about #TeamSawyer (Jonathan Sawyer, Brian Goodman and Jonathan Seeholzer) filling up my feed for days. So great to finally meet Farmer Lee Jones! We arrived at 8:30 and sat with @WhyCLE, Clue Into Cleveland, Miss WineOH, and @TweetMeSlow and their significant others. The place was already hopping! It was a who’s who of the C-Town foodie scene. Lots of Tweeps and fellow bloggers were there including Smitten in Cleveland, @LoquaciousC, The Brewers Daughter, Michael DeAloia of Emerging Chefs, @Justin_McI, @BQRC23,@journeymancook, @lzone and of course the ever present regular at the Greenhouse, @JoeG2001. Also spotted were Chef Rocco Whalen of Fahrenheit and @DougTrattner. As soon as the show started, the place went crazy! The battle between Geoffrey Zakarian vs Jonathan Sawyer was on! #TeamSawyer described the contrast between the two teams as Beards vs Manicures - love it! Mint was revealed as the secret ingredient. There was lots of cheering and tweeting going on. We watched the show on TVs throughout the restaurant and kept up with the tweets thanks to a huge screen displaying the Twitterfeed. Nobody was really able to pay close attention because there was so much going on – total sensory overload! We were truly the noisy and boisterous Clevelanders that Chef Sawyer described us as. Thankfully the show will be re-aired so we can watch it again since I forgot to set my DVR! I want to actually see how he managed to make cheese for the raviolis – first time that’s been done on the show. The absolute favorite of both the judges and mine was the Stoner Sandwich. It seemed to steal the show even though all the other dishes were great. That was in spite of the original batch of chocolate dirt biting the dust in a kitchen mishap and the Chef daring to use an Antigriddle for the first time for the semifreddo. There were lots of requests for this upscale ice cream sandwich to be added to the menu at the restaurant. If they do offer it when you are there, order it! It was fantastic. On WCPN on Monday, Dee Perry interviewed #TeamSawyer members Jonathan Sawyer and Brian Goodman and they revealed that this dessert is based on a Sicilian classic made with foccacia bread and pistachio gelato. I dare say that this one sounds even better than the original. After all the hard work the staff did that night, I gladly bought a Kitchen Coffee! For the cost of one drink, you buy the kitchen a round of beer and then get to ring the bell to let them know you did. I know that they were a happy crew that night because the bell was ringing off the hook. So while Chef Sawyer and his team didn't get to take home the title of Iron Chef, they rocked Kitchen Stadium and had blast doing it. And they really made everyone very proud. We are very lucky to have Chef Sawyer here in Cleveland. 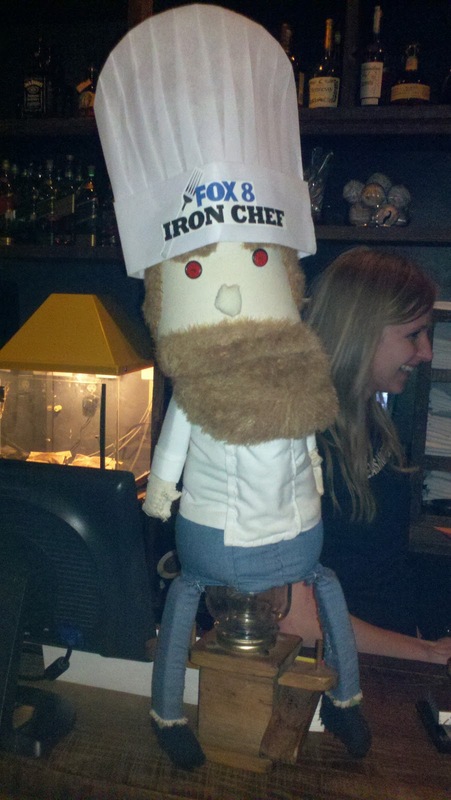 According to Joe Crea of the Plain Dealer, "look for an upcoming special in Greenhouse's basement dining room, featuring the complete "Iron Chef" menu, Sawyer adds. It could come as early as Saturday night, when the show re-airs at 5 p.m. on Food Network." If you haven't done so already, you need to visit both of his restaurants and taste for yourself what makes Jonathan and his team so special. And there's a rumor that there's a THIRD restaurant in the works in Uptown Cleveland by the new MOCA ...stay tuned! You'll soon be able to buy Jonathan's famous vinegar - it's coming out of his basement and into his restaurants so you can try your hand at using them at home. In honor of Year of the Water Dragon, I'd like to introduce you to one of my very favorite fruits - the pomelo. This fruit is a favorite during the holiday season because they are considered a lucky fruit. Chef Ming Tsai writes, "When you say tangerine in Chinese, it sounds like the word for luck. Oranges sound like the word for wealth. And pomelos? They sound like the Chinese word for to have." The pomelo is the giant sized ancestor of the grapefruit and is a lot bigger and much sweeter than the tart fruit we all know and love. Because they are also much more expensive (about $2.00-$3.00 each) they are a special treat that I look forward to all year. If you love grapefruit, you MUST try one of these! If you always wanted to like grapefruit but found them too tart, the pomelo may just be the fruit for you. I honestly never thought to actually do anything other than eat them fresh because I love them so much and only eat a few per year. Their fragrance is an intoxicating floral aroma and the tangy and sweet segments are bright and refreshing. The skin is very thick and the membranes are very tough. But the extra work and expense are definitely worth it! But when trying to find out more about this jumbo sized citrus, I found a recipe that might actually entice me to make my next pomelo into a meal. I found it at The Lemurs are Hungry. It's a great blog for adventurous eaters. First, roast the chicken pieces. Once cooked and cooled, tear them apart into strips. Cut the carrot and cucumber into matchsticks. 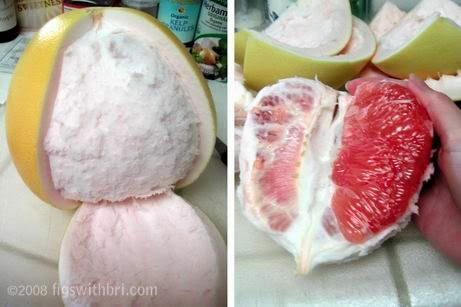 Cut the pomelo into segments. Chop the chilies into very small pieces. Put all of these in a large bowl. Slice the garlic and shallots thinly. Heat a little oil in a small frying pan and sauté each in turn until turning yellow. Add to the bowl. Grind the dried shrimp in a mini-prep until fluffy. Mix this, the coconut and the cilantro into the other ingredients. To make the dressing, pound the sugar in a mortar and pestle until melted. Add fish sauce and about 1/4 cup warm water. Mix well and add lime juice. Taste for balance and add more of anything required. 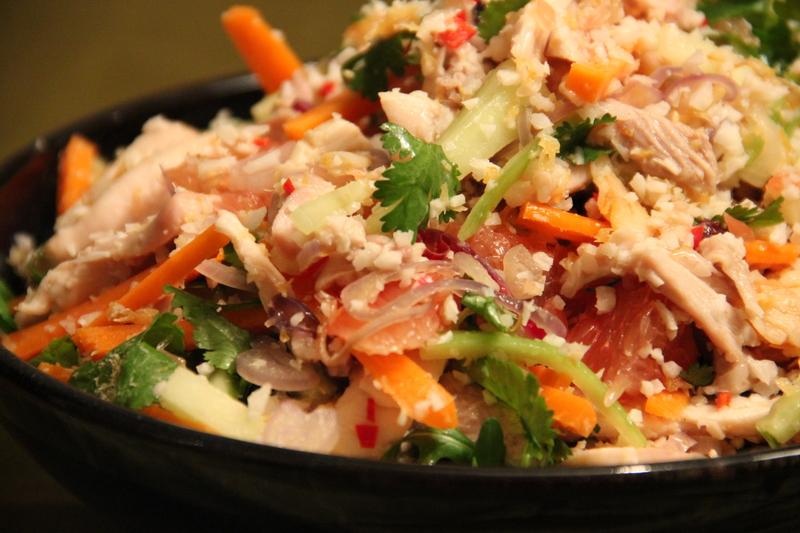 To finish the dish, put the watercress into a large serving bowl and add the chicken and pomelo mixture. Pour over the dressing and mix well. Doesn't that sound delicious? I've never seen this dish on any of our local restaurant menus so I need to hit the Asian market and pick up a few things (for some reason I don't have palm sugar and dried shrimp in my cupboards...) and get cooking. And if you are looking for a pomelo cocktail, look not further! This one from Serious Eats rocks! Click here for the recipe. OBA at Whole Foods: Pizza Night! Every month I look forward to the Ohio Blogging Association meeting. I get to catch up with my blogging friends and meet new bloggers too. There's always something fun to do thanks to the hard work of Alicia of Poise in Parma. This month featured one of my favorite foods (PIZZA!) at one of my favorite grocery stores, Whole Foods. 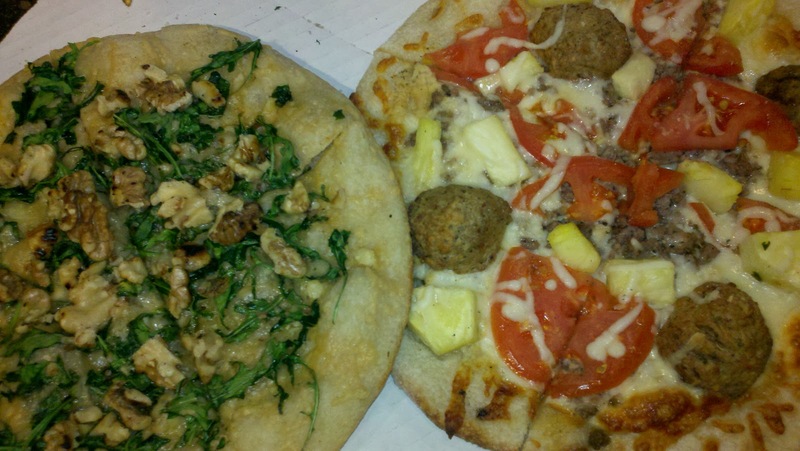 We each designed our very own pizza with toppings as varied as shrimp, bacon, arugula and hummus. Thankfully everyone ended up sharing because it was a lot of fun to try everyone's masterpieces. Top chefs in my opinion were Sarah from Cooker Girl and Kristian of Ohio Festivals. Sarah topped her white pizza (on the left) with arugula, parmesan and toasted walnuts. Kristian gets bonus points for uber creativity with his addition of sliced apples and honey to his garlic and olive pie with eggplant, ham and artichokes (see a pic here.) The honey totally rocked and I can't wait to try this on my next homemade pizza. Lisa from Whole Foods was a wonderful hostess! She did a great job talking about some of the unique features of the store including their Beers on Tap. Yes, you read that right. They feature six beers on tap each month including some rare craft brews. You can buy a refillable growler for $3.99 and then fill it up with your favorite beer. The price of the fill up ranges from $9.99 up to $19.99. 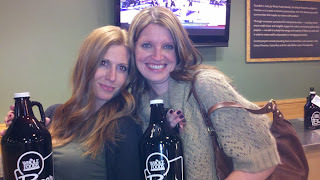 Lisa presented us each with our own growler and I can't wait to put it to use! Kim of Smitten in Cleveland and Jen of Why CLE? For those who prefer wine, not only do they have a great wine selection, they also have a bargain wine tasting every Friday night called 5x7. The first time you go, it costs $5 but you get to keep your wine glass. When you bring your glass to the next tasting, the cost drops to $4 - can't beat that! And not only do you get 5 wines, they also pair food with each pour. If you haven't been to a meeting yet, join us next time! Bloggers, wanna be bloggers and blog followers are always invited. Our next meeting is in February when we will have a wine tasting with Tammy of Miss WineOH. She is known for her fun tastings so it's sure to be another great event. What to see more pics and read more about it? It's the first time I'm going to Dinner in the Dark. For those of you who don't already know this, Dinner in the Dark is a very special event where six local chefs prepare a fabulous meal at a different restaurant each month. You are kept in the dark because you don't know who the chefs are or the menu until you arrive. 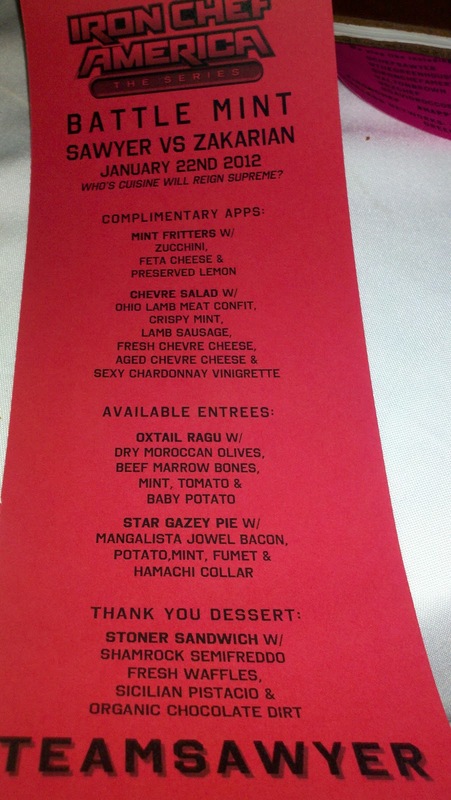 The best part is that the chef's pick a local charity and donate all the proceeds from the event to them. 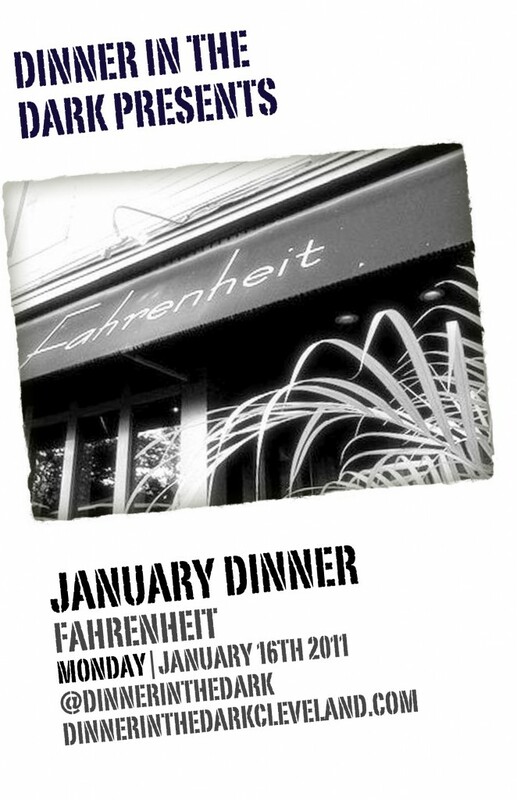 This month the dinner is being held at Fahrenheit in Tremont. It's already sold out so if you want to go, you'll have to sign up for the next one. They are held monthly so you can definitely attend another event. T-shirts will be on sale today at Fahrenheit if you want to grab one. $20 each and the proceeds will also go to the charity of the night. Seems like it may be worse than using your hand. Or having some cute guy open it for you. If anyone is actually brave enough to try it, please leave a comment and let me know how it worked for you. Does it hurt?? While this supposedly works great for twist offs, most of my beer needs an actual opener. This has been a problem for me in the past especially when drinking with Bad Beer Lovers and I forget the opener. Thankfully some other tips on opening beer popped up and I found the perfect trick for opening a non-twist off bottle. An all you need is a sheet of paper. This one, I actually was brave enough to try - and it worked! Hope you find these tips as helpful as I did. Cheers! A few months ago a friend of mine asked if I wanted to try a glassblowing class. It sounded like fun and a great opportunity to have some girl time with one of my best friends - I was in! The class started Sunday at 11:00 so we decided to start the day at one of my very favorite breakfast places Lucky's Cafe in Tremont. My friend EKC has heard all the hype both from the TV shows and my frequent tales of how amazingly delicious the food at Lucky's is and I was happy to introduce her to an awesome local spot. I ordered the famous cheddar scallion biscuits topped with soft scrambled eggs and sausage gravy. It comes with crispy seasoned skin-on cubed potatoes and a bunch of refreshing grapes. The biscuits are the perfect buttery vehicle to carry the creamy gravy goodness to your watering mouth. They have a hint of cheese and onion that enhances the flavors of the eggs and gravy without overwhelming the dish. Even EKC, who claimed to hate sausage and sausage gravy, gobbled up her sample. Perfection on a plate! She chose the seasonal gingerbread waffles with house made caramel sauce, sauteed local apples and whipped cream. EKC wanted to be able to take her extra waffle home so she ordered the toppings on the side. The waffles were crisp and tender with just the right amount of spice. The combo of apples, caramel and whipped cream was amazing - much better than the usual maple syrup and surprisingly, not too sweet. I sadly only got a bite but I know I'll be heading back to get my own order before they are gone. We shared an order of the pecan bacon in an attempt to show some self control. Words can't describe how amazing this bacon is! Chef Haviland somehow manages to maintain the crispiness of the meaty bacon in spite of the heavy coating of finely chopped sugared pecans. The salty sweet combo is bacon heaven - this alone is worth the trip! Ironically, the Food Network's episode of The Best Thing I Ever Ate featuring Lucky's biscuits and gravy aired that same night - and watching it made me hungry all over again! Another favorite of mine is the house made granola. The recipe is on the Food Network site and think I'm going to try to make it at home one of these days. Until then, you can get a bag of it at the restaurant for $4.50 a bag. With our bellies full and big smiles on our faces, we headed to our class. We got a great Groupon deal and were excited to try glassblowing for the first time. The Glass Bubble Project is located in Ohio City, right behind the Garage Bar. They specialize in an industrial style that they call "Clevetion Glass" which they contrast with the more elegant Italian Venetion glass. They use recycled metal objects and glass in their creations. We were greeted at the door by a scruffy but friendly fellow who took our names and welcomed us to the class while holding a can of Miller High Life in a koozie - we could tell already that this was going to be an interesting class! He told us where to stash our coats and find the snacks. Thankfully we had eaten already because the snacks were... interesting. There was art everywhere! Everything from paperweights and ring holders to elaborate chandeliers. The instructors demonstrated how to take the long metal pole, dip it into 2000 degree molten glass, color it with tiny glass bits and blow and turn it into an artistic orb. Not too shabby! At least it's round. The colors aren't what I expected but it's pretty good for a first attempt. EKC had to get home to watch the highly anticipated Steelers-Denver playoff game. I had other ideas. The day was so gorgeous and sunny (especially for January in Cleveland!) that my fun continued with an extra long walk with my pooch Buffy and our favorite neighbor. And some treats too. It felt great to enjoy the unseasonable weather and we all needed the fresh air. Best friends, awesome food, trying new things, my favorite fur ball and sunshine galore - I wish EVERY Sunday could be this fun! It's a New Year ~ Discover happiness. Be alive!